The Wurlitzer Style 260 [Special], Opus 2040 installed in the 2500-seat Regent Theatre Brisbane [Australia] in time for its opening in November 1929, is to be restored by the Queensland Art Gallery, with the assistance of a fundraising campaign conducted by the Queensland Art Gallery Foundation over the next few months. The organ will be restored and installed as a working instrument in one of the Queensland Gallery of Modern Art’s cinemas (located at Kurilpa Point, South Brisbane). "Special" denotes the Diaphone extension to 32'; and the provision of a grand piano. The installation aims to create an environment for silent cinema to be presented in a historically accurate yet contemporary context - alongside other visual arts media of the 20th and 21st century. The Gallery's restoration will retain all of the essentials of the 1929 organ [air console, relays, unaltered stoplist etc.]. The organ is complete except for the grand piano, which was removed from the Regent Theatre prior to the organ’s purchase by Dr Keith King of Lawson, NSW. There is interest to locate the piano if possible. Attached is a photograph of the just-unpacked console, probably outside the Brisbane premises of the installers, B.B. Whitehouse Bros. The organ was removed from the late Dr King's Blue Mountains home in early 2004 and for the next three years underwent painstaking restoration by a team of organ builders from Queensland, New South Wales and Victoria, led by John Andrews from Sydney, Project Manager. The organ was installed in the Cinémathèque Cinema A, which seats 224. The chambers are located below the stage, and the sound enters the theatre through tone chutes that open into grilles in the front of the stage where the pit would normally be sited. Between these grilles is a sliding cover that moves to allow the console to rise to stage level. 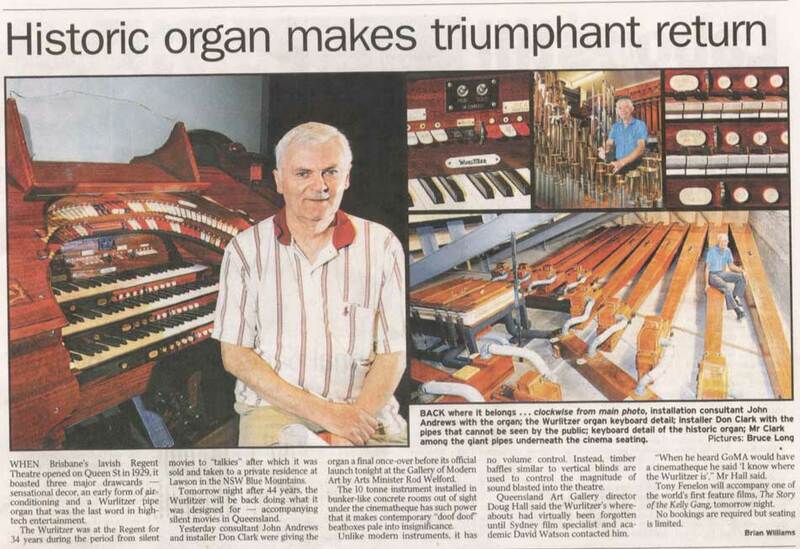 The organ was officially "launched" on the evening of Thursday 29 March, 2007, at a short, but very successful function when Tony Fenelon played a brief programme comprising: Come Fly With Me, Overture The Thieving Magpie, and a selection of music from the musical Phantom of the Opera. The occasion concluded with the organ's use in what will be its primary rôle in its new home - the accompaniment of silent films - as Tony provided the music for the Queensland première of the recently rescued, assembled and restored fragments of the 1906 (world's first feature film) The Story of the Kelly Gang. Until recently it was thought that this pivotal piece of film history survived only in "stills", but 17 minutes of its original 60 have been discovered in a variety of places, enough to collate in proper sequence and recreate the original story, albeit in abbreviated form. For many of the art and film culturati in the invited audience it was their first exposure to live theatre organ music, and conversations afterwards not only covered the finer points of the film, but suggested they were looking forward to hearing much more of the instrument that now forms an unusual and welcome addition to Brisbane's cultural scene. The organ connoisseurs delightedly commented amongst themselves on Tibias, Tremulants, Suitable Basses, console wind and other arcane matters; all were agreed that it is the end result of a fine restoration and installation job and worthy of the highest praise. Among the guests was Ms Betty Kelly, widow of the late Dr Keith King, who between them had cared for and housed the organ since 1964, a longer period than its original installation in the Regent. Many took the opportunity to speak with her and her family to acknowledge their rôle in maintaining the instrument in such complete and well-cherished condition, and for agreeing to its sale so that it could return to Brisbane where it had first sounded. 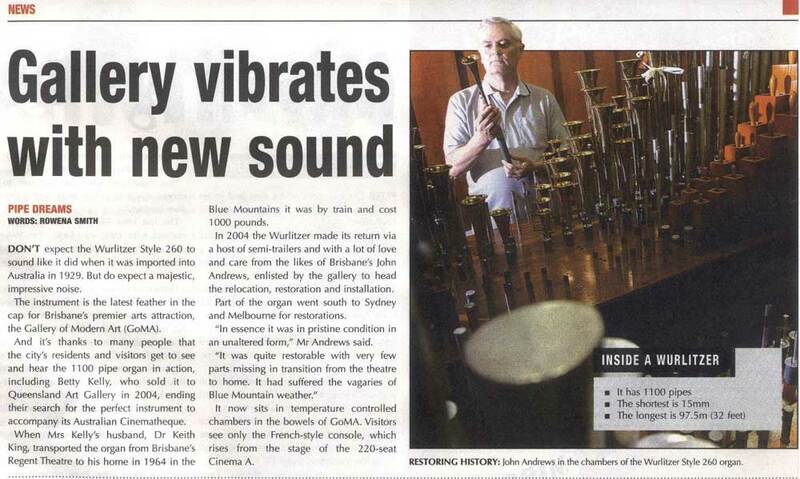 Film and Sound Archive were both astonished by what the instrument could do. Wurlitzer anywhere. The ball rattling 32's certainly assisted with impact. 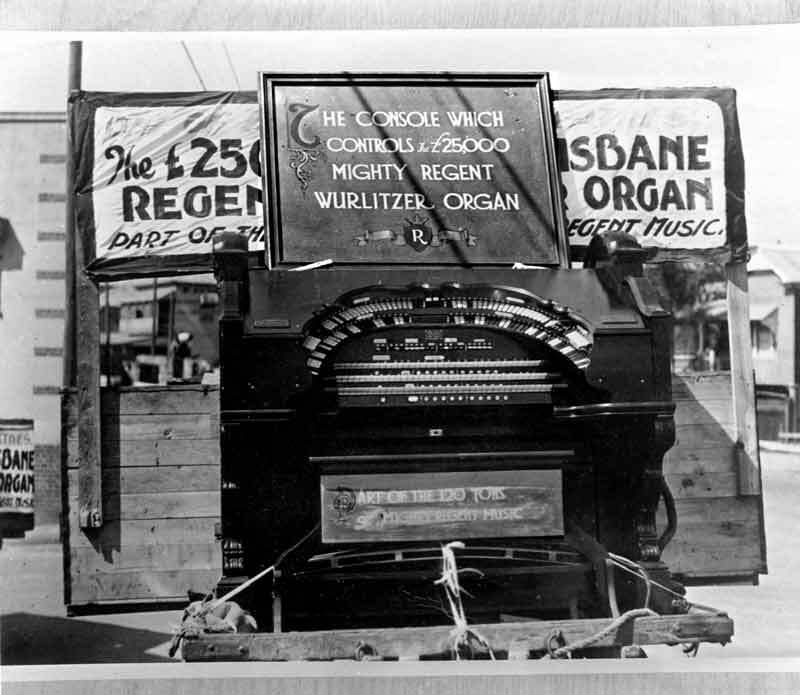 The primary stipulation by the Queensland Government governing the organ's installation in GOMA was that its heritage status in Queensland's history be respected and that no changes be made (or perpetuated had they been made after it left the Regent). The Organ's Specification is therefore unchanged. The console retains its electro-pneumatic combination action, with its characteristic "ker-thump" sound so beloved of traditionalists. The grand piano that was playable from the organ console had been removed prior to the organ's sale from the Regent. It has been replaced with an upright piano in the Solo chamber. The organ's electro-pneumatic relay and stop switches have not yet been connected to the instrument, in which console and speaking parts are linked by a solid-state system. They are in the chamber awaiting connection for demonstration purposes. The organ's two pipe chambers are located side by side with a further large chamber housing the wind regulators, tremulants and relays below. The 32ft Diaphone pipes are located below the theatre floor. The Main chamber contains the Tuba Horn, Diaphonic Diapason, Viol d'Orchestre, Viol Céleste, Clarinet, Flute and Vox Humana ranks, plus the Chrysoglott. The Solo chamber houses the Brass Trumpet, Brass Saxophone, Tibia Clausa, Orchestral Oboe, String, Oboe Horn, Quintadena and Kinura, plus the piano, marimba/harp, glockenspiel, xylophone, chimes, drums, cymbals and other effects.